This looks to be a good movie. However, it appears to be one that won't make it to my town, as IMDb says it's a limited release. It's from a screenplay by the same of "High Fidelity" and "About a Boy." Both were made into movies which I have seen. I also read the book "High Fidelity." I don't recall the film of "High Fidelity" making it to my town when it was released in 2000 as I did not see the film until it was on VHS. "The Halloween selection at thrift stores is always a little depressing. There’s the beatup and never used vampire makeup kit still clinging to the backing card. There’s the 342 baby costumes of Winnie the Pooh and a bunny rabbit. There’s 14 VHS copies of the Olsen twins’ Double Double Toil and Trouble. There is the odd Minnesota State Fair cloth cowboy hat that was thrown in with the Halloween crap. And then there’s the school-age kids who are either poor or just have bad parents, dispiritedly trying to find some sort of passable costume that will fit. But today I found something different. I found a Halloween costume that is scary indeed, but for all the wrong reasons." After reading this post, I felt compelled to look for similar scenarios at different thrift stores. I didn't expect to see much until maybe September, but one thrift store in my town has had Halloween items since June. These are in the back area of the store, and just the other day I spotted near the store register another round of Halloween items. A box of hats including a fluffy pink pimp and hoes hat, a witch hat with a bright pink wig attached, and some odd hat made from some kind of wires that was thrown in with the Halloween hats and that was snagging to the wig on the witch hat. And somehow several pairs of khaki shorts got thrown with these hats as well! Nearby were two racks with used costumes missing parts or two, one or two of those odd pumpkin pajama-like costumes for infants, and sweatshirts and men's short decorated with skulls and pumpkins. A scenario somewhat similar to that quoted above. And like that blogger quoted above, I found something different the other day, something rather disturbing and likely to make one gag. The Fart-o-Meter and how stupid does that sound? And to think a customer placed second in a contest with this thing! Obviously someone thought this was a good idea if they bought it one year and donated it the thrift store. I'm beginning to wonder how this escaped being on this list. Sounds a lot worse than anything you could put on a pet, and as bad as--if not worse than--many of the others listed. In three more days, I will be attending my 20-year high school reunion. Yes, 1989, many years before the Internet, cell phones, and DVDs and iPods. CDs were just coming into vogue (I didn't get my CD player until 1991, however). MTV still played music videos and TBS was carrying "Brady Bunch" and "Sanford and Son" reruns. God, I loved watching that stuff! I was in my first semester of college when the Loma Prieta Earthquake struck in October of 1989. I missed three days of school because of this disaster. My high school's mascot is one that might seem unusual to many people outside of Hollister, California. We're the Haybalers, or Balers for short. Read this archived article from Sports Illustrated in 1986 by a staff writer who once attended San Benito High School. 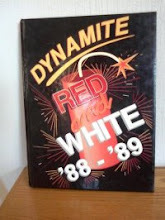 Below is the cover of our yearbook from the 1988-89 school year. I can't wait to see this movie. Even though I'd never heard of the book on which it's based, it sounds like it would be fun. I first learned about this upcoming movie through this link. But now I'm beginning to see the book for sale, at Barnes and Noble and at Target. And just last week at the local movie theater, I saw a large freestanding poster promoting this movie. Should be fun! Halloween is more than two months away, but you can expect to see the Halloween stuff arriving in stores soon, if not already. And some may have already decided on how to alter their identity for the one day of the year that we can do so, while others may still be deciding. Halloween costumes range from the traditional witches, vampires, black cats, clowns, pirates and such. But there are also these each year that seem to be inspired by current or recent events, films, books and by celebrities currently in the media. It's already believed that Michael Jackson will be a popular one this year. And this link suggests honoring Farrah Fawcett as well. But I don't expect to see a lot of people being Farrah, except maybe a few who are old enough to remember her days on "Charlie's Angels." And there may be just a few who feel the desire to be the late Oxi Clean pitchman Billy Mays. Some might find this one hard to imagine, but it's actually been done by someone last year in the photo below. There is even a Costumezee idea for making a Billy Mays costume. Today, however I saw this idea which seems a whole lot more scary than Michael Jackson, Farrah Fawcett or Billy Mays. And scary for the wrong reasons. Here's how to make this one. And there is an actual Octomom costume for sale. And there are a couple ideas I encountered that are similar in theme to this idea: Trailor Park Tina and Baby Factory. And the link to the above picture says that the Octomom idea creeps them out and the wasted Ernie in the background is just icing on the cake. I can't imagine seeing the Octomom alongside Michael Jackson, Farrah fawcett or Billy Mays, if any of these should turn up somewhere together on Halloween 2009. A scary thought indeed, IMHO. As I already stated, I've been invited my many friends on Facebook to various farming applications. And I started inviting others to another one, which I can't seem to get to load! And trying to find time to tend all my other imaginary farms, I don't know how I'd ever do it for real. Since I didn't grow up on a farm, I know nothing about them. Thanks to my Facebook friends' invites I've been a virtual farmer, with farms on MyFarm (though I don't use that one anymore) Farm Town, Farmville, and Farm Pals. So just now I checked out Lil Farm Life. Any others I or they missed? Similarly, I've received virtual drinks from various drink applications, and then I started sending them from Drinks on Me. And I've played the very similar Fashionista and Fashion Wars. You are a dramatic, wild, and even weird person. The dark side of life fascinates you, and you enjoy being a little terrified. You enjoy the hidden sides of life. You are interested in what lurks deep in people's hearts. You are playful and creative. You enjoy pretending you're someone else. What makes you celebrate: Anything bizarre, unusual, or freaky. At holiday get togethers, you do best as: The entertainer. You really like to get into the mood of the holidays.